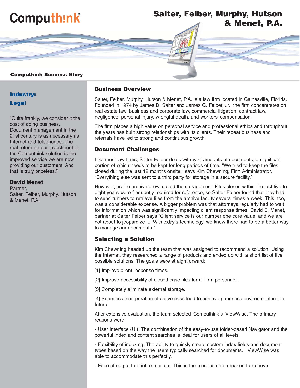 > Computhink > Document Management Case Study: Salter, Feiber, Murphy, Hutson & Menet, P.A. Document Management Case Study: Salter, Feiber, Murphy, Hutson & Menet, P.A. Like most law firms, Salter Feiber deals with vast amounts of documents, a significant portion of which needs to be kept for long periods of time. "We tried to keep the files closed during the last 12 months onsite," says Kim Chewning, Firm Administrator. "Everything else was sent to a third party for storage in a secure facility." However, as the archive grew, so did the storage cost.